It was an Oldton contributor called Trailer Star who raised something that had been worrying me for a while. Are terrorists or the government (or both) using my online search to send secret messages across the globe, buried deep within the pixels of a photo or the headers of emails? I have been studying steganography recently and I see what is possible. 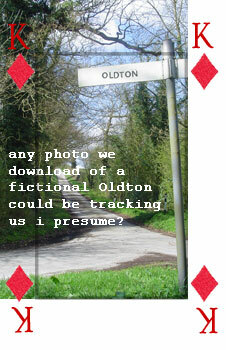 If this was so, the real Oldton would have had to disappear to facilitate the covert operation. It would be easy for a government to get rid of a single town. Let's face it, somewhere in the world it's happening right now, for sure.